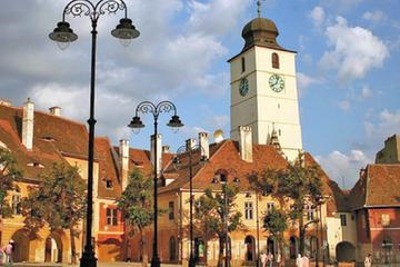 Sibiu is the pride of Romania. This is a city, which cares so much about its history and culture so that visitors would always get excited when visiting it! The medieval architecture buildings stand side by side with modern entertainment establishments. 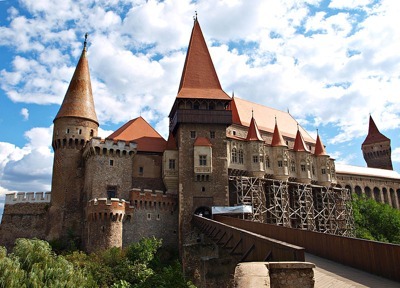 Sibiu has numerous directions to take and great sites to amaze its visitors. The History Museum, City Walls, Brukenthal Palace, St Mary's Evangelical Church, Bridge of LIes, Pharmaceutical Museum, Natural History Museum, Franz Binder Museum of World Ethnology are only just a few of them to explore and admire. If one would like to get a real glance at the beauty of this city than the best way will be to rent a bus with a driver in Sibiu. Our 24/7 customer support is always ready to receive orders, answer your questions and provide you with any support they are competent for. We have made the communication with our clients possible through email, phone, and Skype. 8Rental is glad to inform you that the fuel necessary for your tour is included in the offer, as well as for all the fees and taxes that may occur. By getting a quote and filing it out, you will get the accurate price for your order with no hidden fees! We do really work for you and will keep on doing everything we can to make our clients' transportation in Sibiu as comfortable as possible! 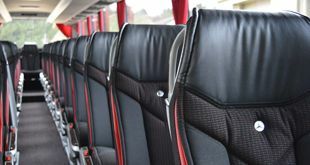 If you are welcoming a large group of tourists in Sibiu, which is, perhaps, up to sixty-five people, 8Rental suggests booking a Mercedes Tourismo with a driver, as this is the most capacious bus type we have in our fleet. It can accommodate all of you in complete comfort. Besides looking great, it is also equipped with a series of stunning amenities, which include a toilet, a little kitchen with a fridge and a coffee machine, amazing and soft ergonomic seats, as well as air conditioning, air suspension, and so forth. Before you rent this chauffeur driven bus in Sibiu for your tourists, we'd like to draw your attention to its two options - standard and VIP. The latter is remarkably better equipped but of course, is at a higher price. The choice is yours! Nevertheless, in case your group of travelers is relatively smaller, there is absolutely no need to book such a huge vehicle as Tourismo. Instead, you can consider renting a Mercedes Sprinter. The coach is more compact, yet is also well-equipped. Besides the carpeted floor, the tinted windows and reading lights, there are other specs, too, including air conditioning, central heating, premium audio system, etc. 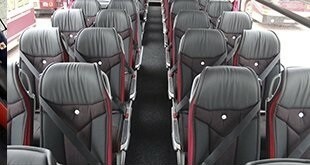 And if you would like to add some other spec into the coach you rent, just let us know beforehand. At an additional cost, we can supply some extra amenities. The coach can drive around two dozens of passengers. All our coaches are in excellent condition and the driver will drive your guests along the city's roads in complete safety and comfort. Rely on us as we tell you that thousands of others have done the same and had their expectations exceeded! Are you worried who will be driving a huge bus you want to rent from us? There is no need for that! 8Rental is a respectful European car supplier which has earned its reputation not only due to providing its clients with amazing vehicles but also due to cooperating with expert drivers! These are licensed and qualified chauffeurs who have years of experience in driving big vehicles. They are reliable and responsible, and they also are fluent in at least one of the international languages. Taking into account the fact 8Rental has never registered any accident, both you and your guests are in full safety! Entrust your journey with us and you will see how it is to fully enjoy it!